Monu Tamang made a news with his first book 'Joy of Beautiful Dreams' when he was still in high school. 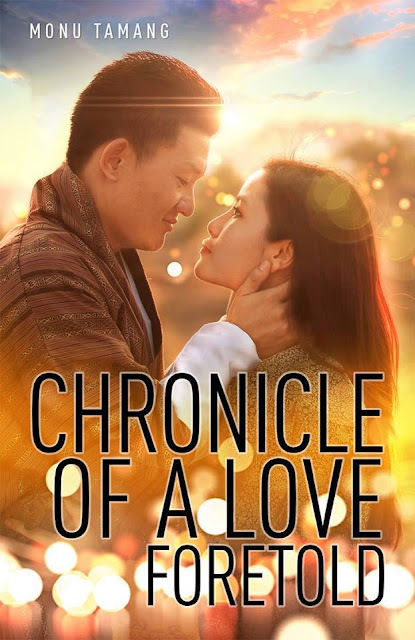 Then he left for college in India on scholarship where along with his four years physiotherapy course he completed his first novel 'Chronicle of a Love Foretold' and made another news. The story about the book and the story in the book, both are equally fascinating. A young college student publishing a novel in itself is a big story considering how lots of young people waste their college life like vacation. Besides the book was crowd published, which made another story. It's a unique model improvised by my friend and co-founder of Writers Association of Bhutan (WAB) Nawang Phuntsho that divides the cost of publishing into packets and allow individuals to invest in parts. Monu's book was jointly published by over 30 WAB members and what is more interesting is the marketing strategy the model offers. All 30 investors become marketers making the model crowd publishing and crowd marketing. Thus the book became the fastest sold book in small Bhutanese market. The story in the book is set in Raichur in south India and it's narrated in first person by a physiotherapy student Kinga. Personally knowing the author too well and knowing that he went to that college and took that course made it difficult for me to separate Kinga from Monu in most of the chapters. However having been there for four years Monu takes us on a very exciting tour of his college and gives us an insight into his course through Kinga with fascinating details. It's a story of friendship and love in college told very convincingly with interesting characters. The parents elements add strength to the entire fabric of the story. Kinga loves his mother and hates his father, whom he never met. He has serious trust issues and avoids intimate relationships until he meets Namsa. She happens to be engaged with another man. And when he thinks the worst has passed he finds Rani from his past ruining his present with Namsa. She leaves and his world crumbles. Years later his patient in Paro Hospital gives him the direction in life, and more... I shall stop here before I risk ruining the charm of suspense. In between the stories of fun the author gives us a disturbing insight into the lives of our children studying in India. This book is not for parents whose children are studying in India because it could cause heart attack. They are going to discover where their children are pumping their hard-earned money into -- romance, amusement parks, smoking, drinking, fighting, biking, holidaying ...without a care in the world. Could the rumour of some students intentionally failing so that they could go to Indian college be true? The author, Monu Tamang, on the contrary not only aced his physiotherapy course but also completed a 227 paged novel, which is evident that he spent his days in India differently and did the nation proud. Where can i get this book? Any suggestions but remind i am not using Facebook. Where are you Sangay? If we know your location then we can tell u where to get from. Where can we get in Thimphu la? @Sonam Dema In Thimphu you will get it in most of the bookstores. For sure it's in DSB. Time to export them to Malaysia, so that I can read them too!